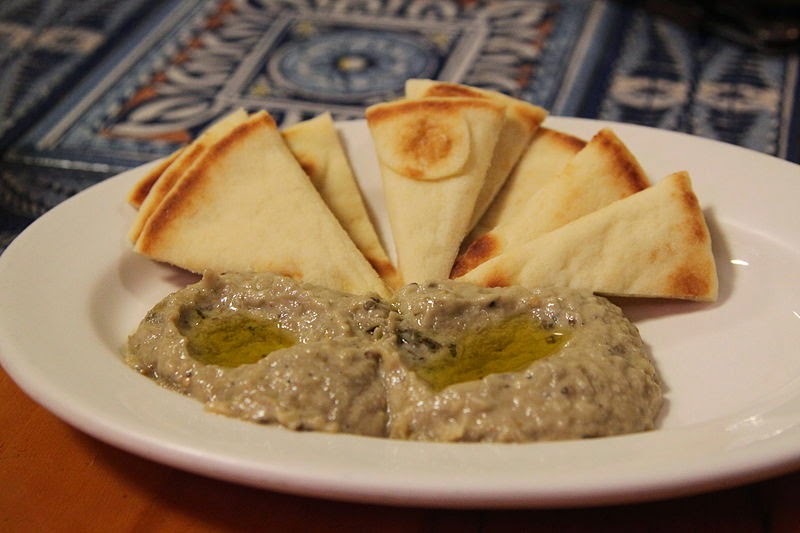 Baba Ganoush is another very tasty and healthy spread option for a great breakfast. Just as the homemade hummus which we published here, it's a dip of Levantine origin, loved and prepared worldwide. The key ingredient in this recipe is the roasted eggplant. The original recipe calls for a flame roasted eggplant, so if you have access to a garden grill, wash the eggplant and roast it on coal or gas grip until the skin is charred on all sides and the eggplant is soft to the touch. After that, if the skin isn't already broken pierce it and put it in a strainer so the excess liquid strains away. As a last resort, put the whole eggplant it in a baking tray and bake it in the oven for 30-40 minutes at 200 degrees celsius (390 degrees fahrenheit) but this method produces much less flavour. If you haven't already, pierce the skin and put it in a strainer. Let the eggplant cool a bit, then peel off the skin and cut the stalk. Put the peeled eggplant back in the strainer and let it reach room temperature. The rest of the prep is done in a food processor, so follow the sequence of layering for best blending results and no chunks of stuff left in the processor. Tear the eggplant into 4-5 large pieces and put it between the blades of the food processor. Peel the garlic cloves and put them between the pieces of the eggplant. Put in a good large pinch of salt over the eggplant - adding salt is to taste. I like to add two pinches of salt to counter the sweetness of the tahini. Put a small non-stick pan on the stove, and put the cumin seeds in. Toast the cumin seeds for a couple of minutes - the cumin seeds will start to pop and jump from the pan, stir them around with a wooden spoon for a couple of minutes and pour them over the eggplant in the food processor. Stir the tahini in the jar because it tends to set to the bottom of the jar. Pour two tablespoons of tahini over the salt and cumin, thus capturing them and preventing them from flying all around the food processor. Add a tablespoon or two of olive oil over the entire mix in the food processor. Close the food processor, and blitz everything until you turn the contents into a consistent paste. To get a better smoothness, pause the food processor once for 30 seconds and then continue. This will allow the olive oil to seep around the stuff and create a finer paste. Pour the baba ganoush into a container, seal and refrigerate. It will reach it's best flavour after 1 hour of resting when all the flavours are evenly distributed and dissolved. Final hint - wash the food processor immediately, since the tahini is very sticky when dry. If you don't clean it quickly, you'll have a very long and bad time cleaning the dry sticky stuff from the food processor.